Keeping a one year old constantly entertained is about as easy as trying to keep a bunch of monkeys seated on a coach journey to Scotland and back. It’s relentless and near on impossible most days. She’s into everything and everything has about a twenty second interest expiration. She wants keys, she has keys, she lobs keys. She wants a book, she bites the book, she chucks the book. You get the idea. I’m not ashamed to already admit that I’m rather looking forward to the day when I’m yelling at her to switch the television off because her eyes will go square. But until that day arrives, as a family, we are having to pull just about anything out the bag, tag team style, to keep our little girl entertained and away from the food blender which is her new current obsession. 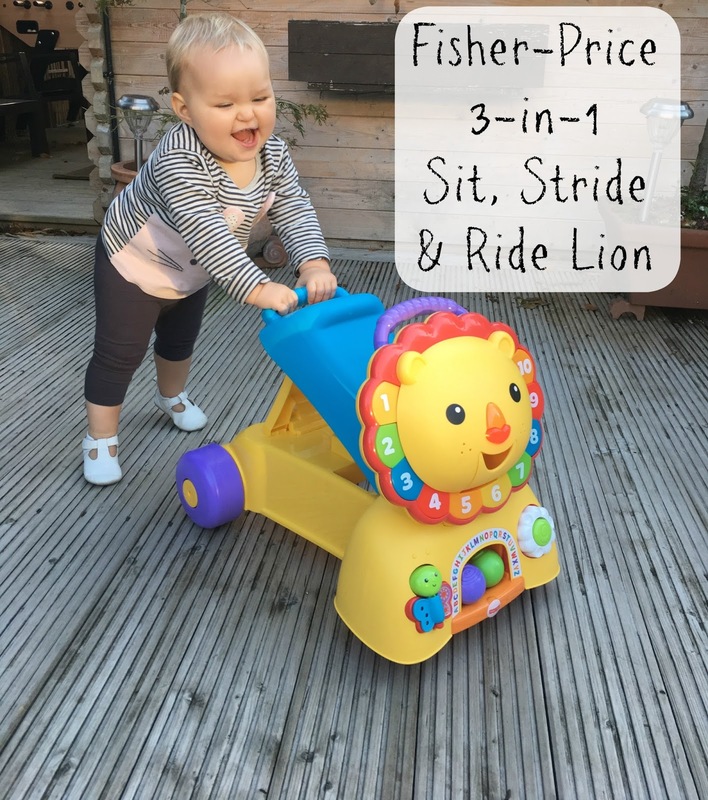 So when Fisher-Price got in touch and asked if we’d like to try out their jazzy new 3-in-1 Sit, Stride and Ride Lion, I practically bit their hands off. 1. 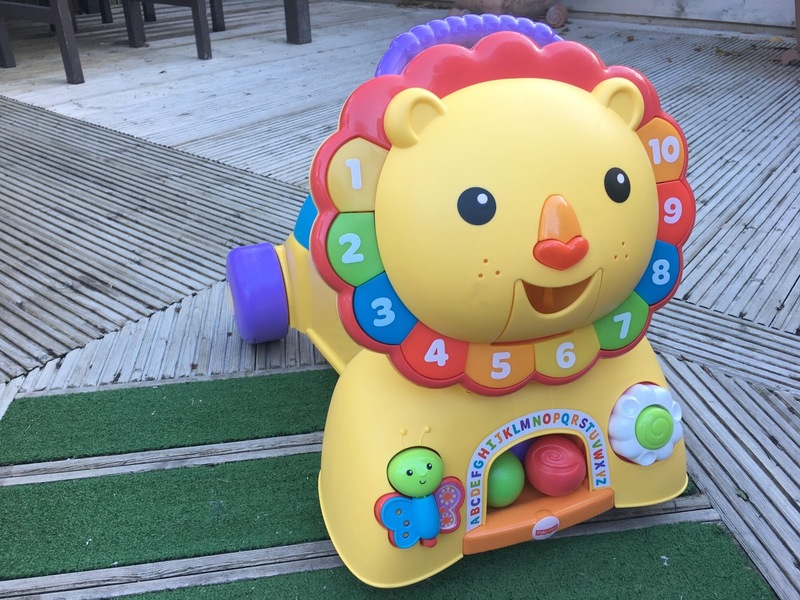 The sit and play aspect includes ten light-up buttons, cleverly designed around the lion’s mane that activate fun songs and phrases. 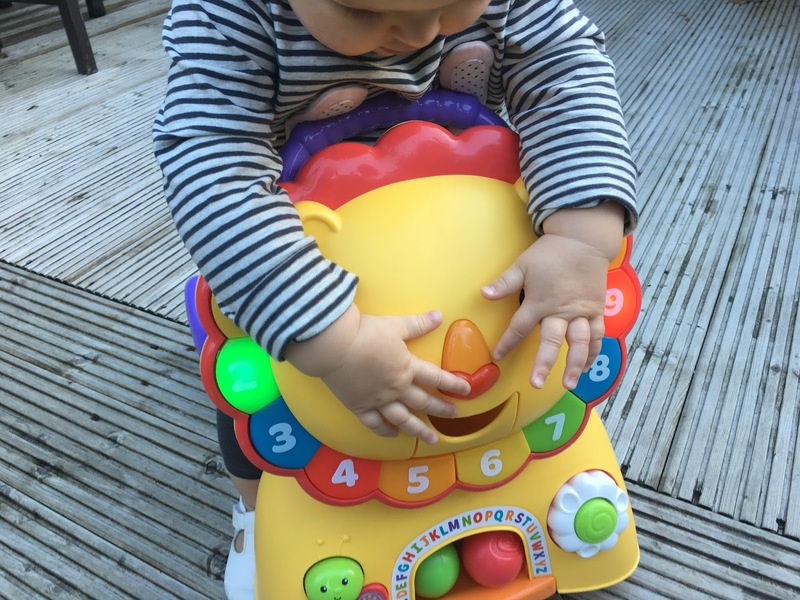 The lion’s nose lights up and his mouth opens to encourage hand and eye motor skills too, along with two other spinner and flap aspects for baby to play with and explore. 2. The lion’s back creates a ride-on for baby to scoot around and explore their surroundings independently. 3. The seat can then be popped up to become a handle so that baby can push and walk the lion to encourage their walking skills. The lion is bursting with songs and phrases with each and every activity. 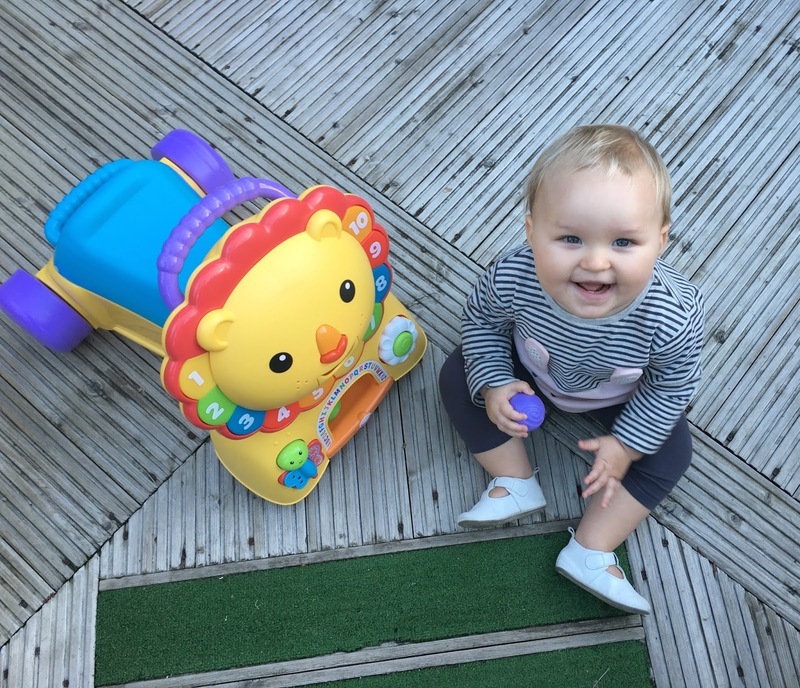 There are so many aspects to this ride on toy that Elsie’s been enjoying. She’s still not walking yet so anything with multiple activity points is a real bonus otherwise she quickly loses interest and darts off doing her ‘crab swag’ to find something else. 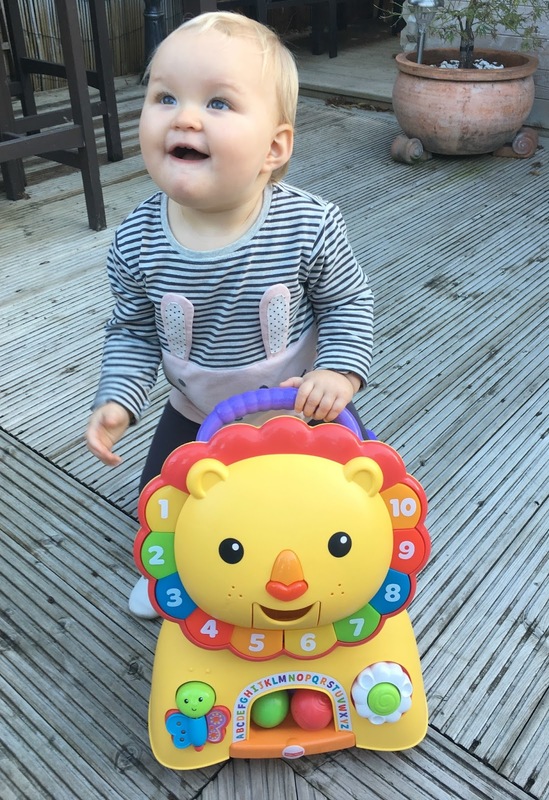 She’s being a little stubborn when it comes to attempting to walk so it’s been great seeing her face light up when she pushes the lion along as it takes the focus off encouraging her to walk. 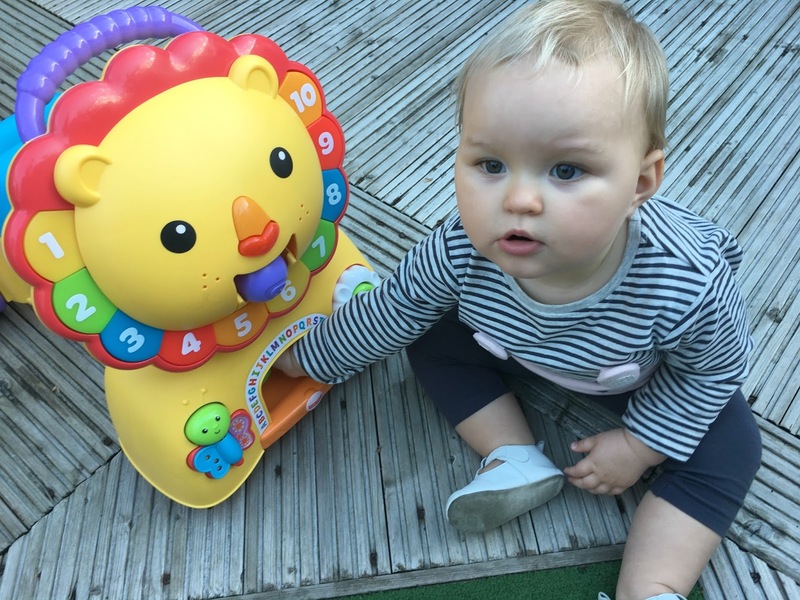 Elsie loves the colours and of course the musical aspects of the toy and I love seeing her bop her head to all the different sounds as she presses the buttons around the lion’s mane. I was also impressed with how well she inserts the balls into the lion’s mouth as its mechanism is quite stiff, but she manages it if someone is holding the lion steady. The funniest part for us is seeing her confusion when she scoots backwards on the ride-on. She hasn’t quite figured out how to move forwards and she looks baffled as to why she’s moving further away from us. I’m pretty sure it won’t be long until she clocks on and starts happily ramming our ankles with it. Can’t wait. It’s entertaining. 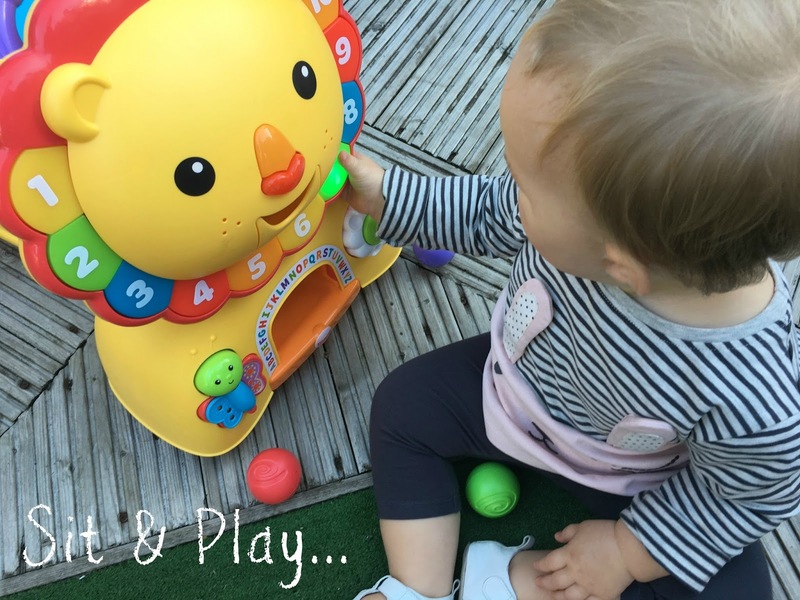 There are so many great things about this 3-in-1 toy that I was impressed with including how entertaining it is for us as a family. It’s so brightly coloured and the music and sounds are great, encouraging baby to learn numbers and songs. 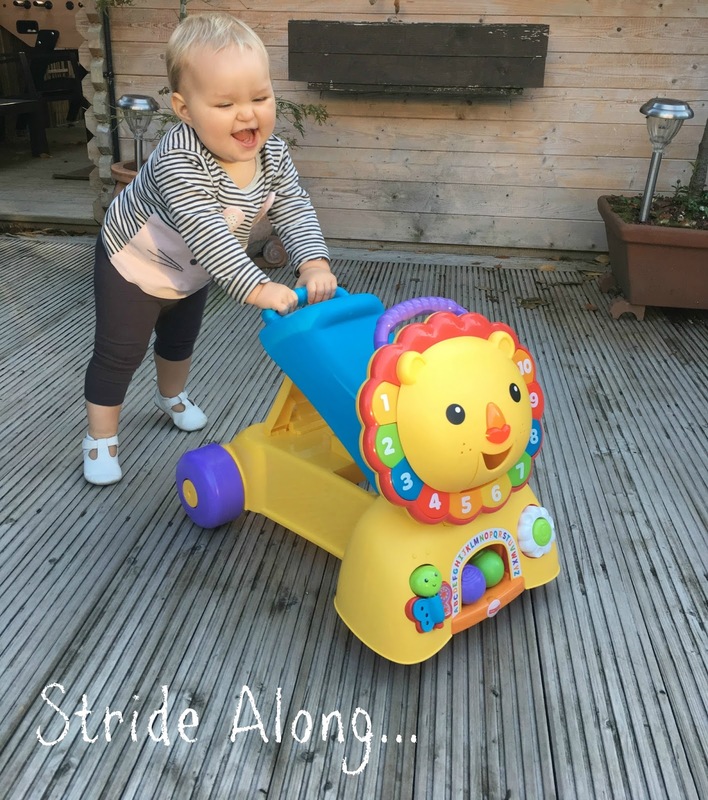 The lion’s nose says phrases and sneezes when pressed which is cute and he then reacts when the lion is pushed along which I think will be more appreciated once Elsie is on the move more independently. It’s versatile. It’s not often you discover a toy that caters for such a range of activities for baby who is beginning to move. 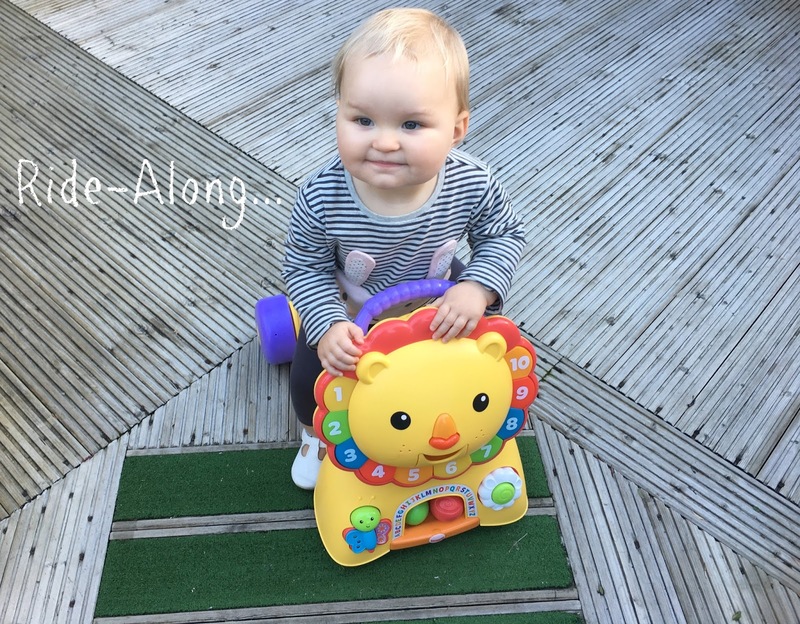 Having the option to walk, ride and sit to enjoy a toy is brilliant and I know that it will adapt to Elsie as she grows for quite some time. It comes with batteries. You know you’ve become a parent when you’re relieved that a toy comes with batteries. There’s nothing more annoying than when you’ve gone through all the excitement of dismantling a toy from it’s sky-diving proof box to have to go on a hunt for a screwdriver and some batteries to make it work. This lion was singing and flashing away at us the minute he was freed. Score. There are only a couple of aspects I would slightly alter if possible. Firstly the mouth is quite tough to insert the balls into. Elsie does it OK if the lion is being held securely, but this isn’t ideal for a baby with zero patience if you want her to play independently. Babies are obsessed with taking things in and out of bags, buckets or trunks so it would be great it the ride along provided a little storage compartment under the seat. When the push-along aspect is set up, Elsie keeps trying to put the balls under it but they keep falling through. It’s not entirely necessary, but an aspect that I know would buy me another five minutes peace if it were possible. Thank you Fisher-Price for working with The Enchanting Blog.